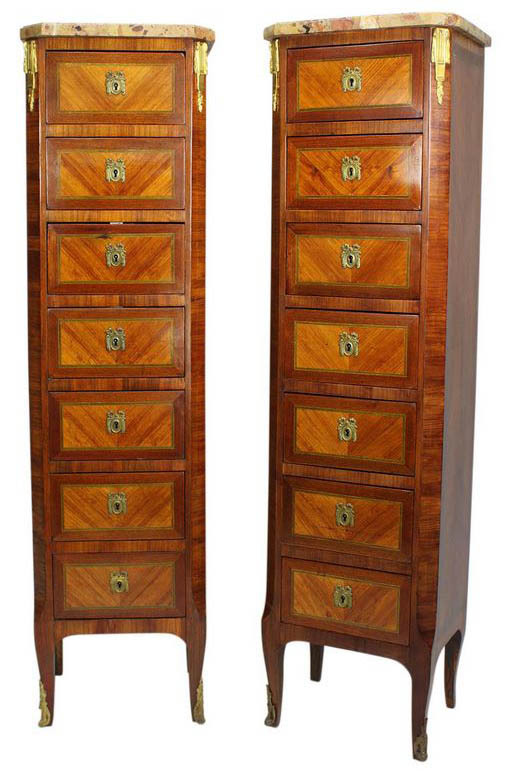 A Pair of French Louis XV Style "Semainier" Tall Chest Commodes with a Brêche d'Alep Marble Top. The slender walnut and tulipwood body, each fitted with seven drawers with gilt-bronze mounted key escutcheons and sabots with allegorical corner gilt-bronze mounts. Circa: Paris, 1900. A Semainier is a chest of drawers, usually tall and thin, originally intended for storing a week's supply of clothing, undergarments and or lingerie. 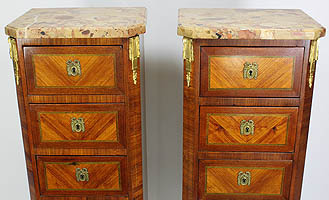 Originating in 18th-century France, semainier has come to mean any seven-drawer chest these days but the term is sometimes erroneously applied to tall thin lingerie chests with only six drawers.